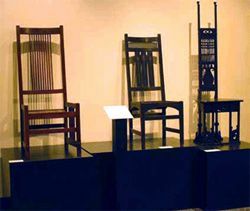 Tarpon Springs, FL -- At the turn of the Twentieth Century, a spirit of reform now known as the Arts and Crafts movement transformed American furniture, ceramics, metalwork, textiles and other domestic furnishings. The new philosophy, which originated in England with the philosophy of designer, critic and poet William Morris, rejected the poor design and shoddy construction of manufactured goods swamping the retail market in favor of a sophisticated simplicity inspired by nature, high-quality craftsmanship and straightforward materials. The Leepa-Rattner Museum of Art presents the exhibition, "The American Arts & Crafts Home: 1900-1915," which present several icons of the Arts and Crafts movement taken from The Two Red Roses Foundation collection. The foundation enjoys one of the finest collections of classic pieces from this period collected by Rudy Ciccarello, who has endowed the foundation with his personal collection assembled over the last eight years. The exhibition will be on view through April 16, 2006. A classic, early Gustav Stickley armchair, three exceptional carved and painted Byrdcliffe Colony cabinets and an eccentric revolving desk designed by Charles Rohlfs are among the nearly 100 pieces on display. Pottery and tiles by Grueby, Rookwood, Newcomb, Overbeck, Saturday Evening Girls and Teco, the leading ceramics shops of their day, and metalwork by the renowned Dirk van Erp of California, will be shown, as well as leaded glass windows by Stickley and Frank Lloyd Wright. Side chairs from different Arts and Crafts designers reveal individual design within a common theme. Paintings and woodblock prints by Arthur Wesley Dow and others will reflect a parallel modernist aesthetic promoted by American artists and educators. Charged by its founder with fostering public recognition and appreciation of the high quality craftsmanship and design philosophy of period, The Two Red Roses Foundation will continue to expand its collection, even as it turns its attention to an active exhibition and education program. The Leepa-Rattner Museum of Art, 600 Klosterman Road, is the site of the foundation's debut exhibition.